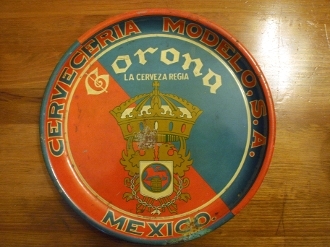 Corona Cerveceria Modelo, S.A. Mexico beer serving tray with 13" diameter. Tray has some paint loss in center of tray. Edges show some wear. Back has crown logo with typical edge wear. Maker marked Brown and Bigelow International, Mexico, D.F. Good rare tray for collector.